Canadian Immigrant has announced details of its Career, Education and Settlement Fairs for newcomers. The Toronto one is being held on Monday, June 15 at the Metro Toronto Convention Centre. The magazine says its signature fair has proven to be a great opportunity for newcomers, immigrant service providers, educational institutes and employers to learn, engage and connect with each other. 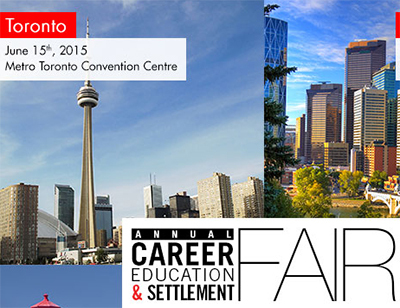 The fairs feature diverse sponsors, exhibitor booths and speakers’ workshops led by experts in various fields of interest to new Canadians, from careers to immigration law. Other highlights included onsite resumé clinics, speed mentoring and more! They say the goal is to inform and motivate new Canadians as they begin and continue their settlement journey and aim to provide essential information and tips on job hunting, accreditation, upgrading of education, looking for a home and more. This entry was posted in Uncategorized and tagged brits in toronto, canadian immigrant, career education and settlement fair on May 5, 2015 by britsintoronto.